Sami Khedira is set to sign for Juventus this week, disappointing several other clubs who had hoped to sign the Real Madrid midfielder on a free transfer this summer. Juventus have been in Germany this week to talk to the World Cup winner’s representatives and the 28-year-old is set to have a medical in Turin later this week. Marotta added that the club will do everything they can to keep hold of Paul Pogba and Arturo Vidal, with the former being linked with a move to Manchester City and Paris St-Germain and the latter with a transfer to Arsenal. 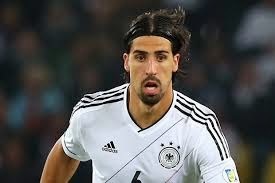 Khedira joined Real from Stuttgart in 2010 and has won the league, the Spanish Cup and the Champions League during his time in Spain, but has suffered from injuries this season and barely featured for the first team. The midfielder said last weekend that he had felt “frozen out” at Real since the turn of the year. “I did have a small injury, a pain in my right heel, but that wasn’t why I wasn’t playing,” he said. “It wasn’t a complicated injury. I was able to play.